← Howdy Neighbor! It’s January 31st! About a year ago, I decided I would grow some pretty little beans that would add color and interest to my garden. I did not have a long-term plan for the actual dried beans, but I thought it might be nice to have them. Now it is time to do something with these beans. This is new territory for me, I’ve never cooked a dry bean in my life. And like anyone who has nursed anything into existence, I’m a bit reluctant to get started for fear of messing something up. After all, these beans have been a year in the making. I first chose these beans from Johnny’s Seeds based on their lovely color photo and the promise that these Tongue of Fire beans retain their flavor no matter what you do with them, and could double as snap beans if I chose to pick them early. I was pleasantly surprised when they poked out of the ground in early June, ahead of the other beans I had planted and much healthier looking. They further pleased me by not being eaten by whatever ate the other beans. I’m not sure if it was the sunny location, or the constant tending by my son, but these beans looked great for the entire season. They were the beauties they promised to be. Bean seedlings emerge, sharing space with marigolds and tomatoes. I’ve decided on a recipe for Pasta and Bean Soup from We Called It Macaroni by Nancy Verde Barr. This cookbook is written in such a way that it’s hard for me to stop reading Nancy’s personal stories and anecdotes. I’m drawn to her simple Italian bean recipe by her memories of running her hand through the bags of dried beans at the local Italian market of her childhood. She has a knowledge and love for beans! How perfect. I love this Italian American cookbook. It’s a multi-step process to take beans from dried to mouth-watering. And let’s not forget the months already spent growing the beans, the weeks drying them, and the time they’ve spent on my pantry shelf awaiting this day. Out of the jar and ready for action. I have to admit I had some fun playing with these beans in their dried form. Now that I’ve had my fun making bean arrangements and photographing them, it’s time to begin the bean bath. 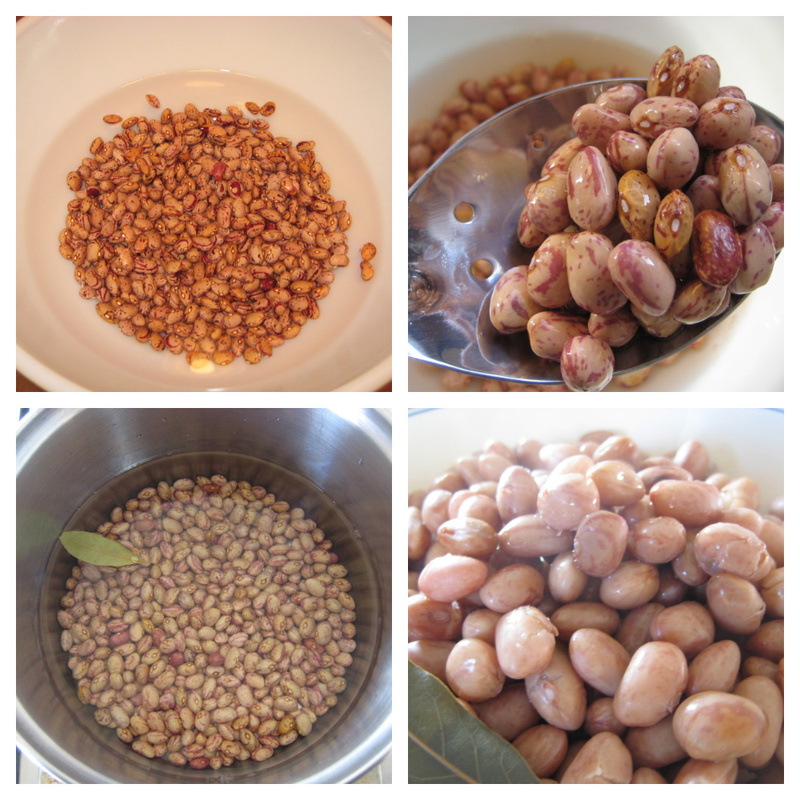 Dried beans need to be soaked overnight, or they can be subjected to the “quick soak” method which involves heat and less time soaking. For my purposes, overnight soaking worked just fine. Following the overnight soak, they were drained, put in a pot with cold water to cover 2 inches and a bay leaf, brought to a boil and then simmered for an hour. I couldn’t resist stealing a few from the pot here and there and calling it a “taste test”. 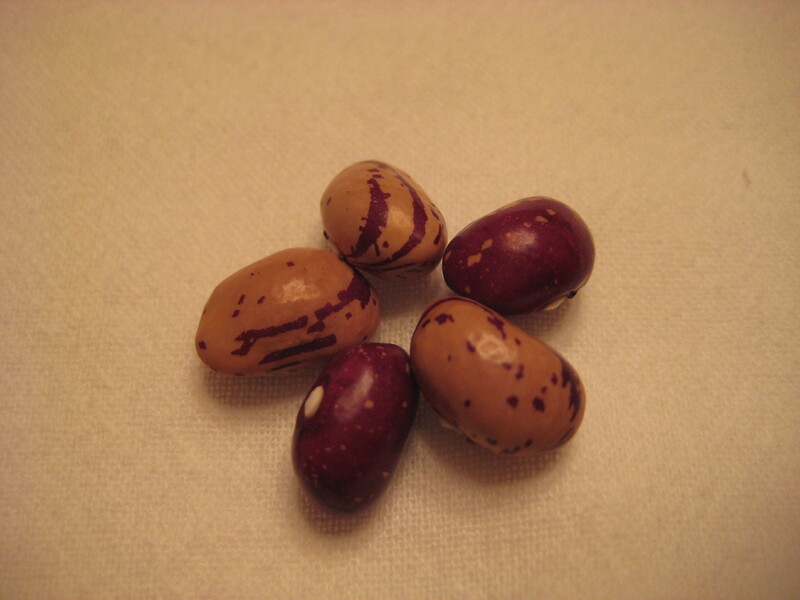 The cooked beans had a pleasant texture and great bean flavor. Soaking and cooking the beans. Now the beans were ready for the recipe, twenty-four hours after I pulled them out of the pantry and one year since I purchased the seeds to grow them. Beans were added to the Bean and Pasta Soup, then served with a smile. Delicious! I think the lesson here is that sometimes slow is good, really good. In a world where we are accustomed to instant gratification, it seems odd to wait so long for a bowl of bean soup. It might even be kind of backwards if I thought about it too much. I could probably buy a bowl of bean soup for $2.00 at the local deli. Instead, I’m sure I spent at least that much on the envelope of seeds. 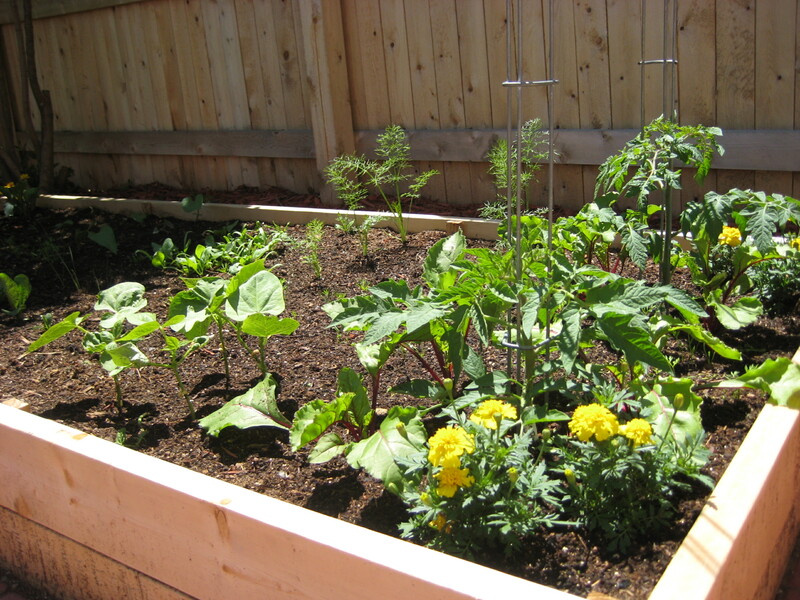 I had to use garden space and water to grow the beans. It took time and energy. Cooking them involved even more time, the purchase of a few ingredients, and of course that dreaded chore: cleaning up the kitchen and dirty dishes. It was an effort that seems a bit out of proportion to the result. Or was it? As a gardener, I get so much satisfaction out of eating something I grew. Especially when it turns out so well. As a mom, I am able to glean so many lessons from the simple task of making this soup. 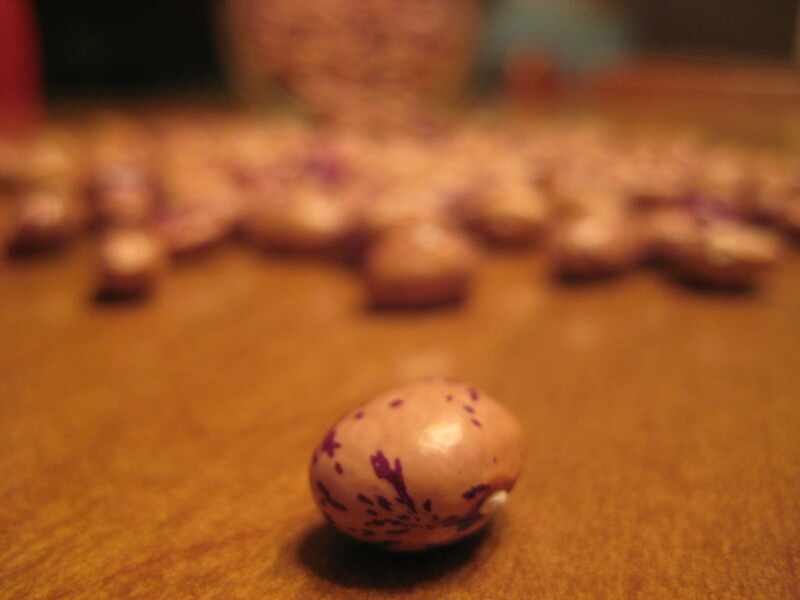 My kids know how a bean grows, they know what a bean–both raw and cooked–tastes like. 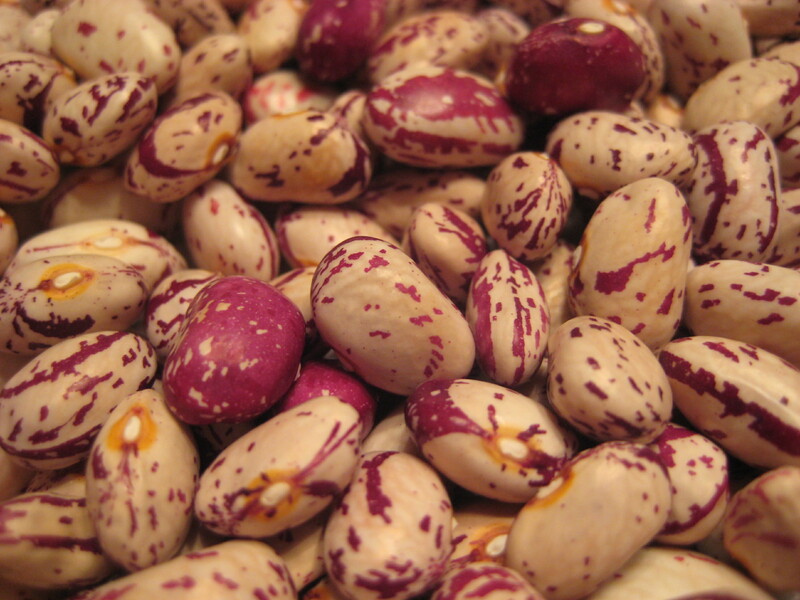 They know the joy of running their hands through a bowl of dried beans, just like Nancy Verde Barr remembers from her own childhood. They know that God gives us the resources we need to provide for ourselves and our bodies, if we will just put in the effort. They help with measuring, stirring, “taste tests” and serving the final product. We look outside, where a five-foot snow drift rests against our patio door. How awesome is it to enjoy something from the garden on a particularly wintry day when I can’t even walk out the door if I wanted to? It is awesome indeed. 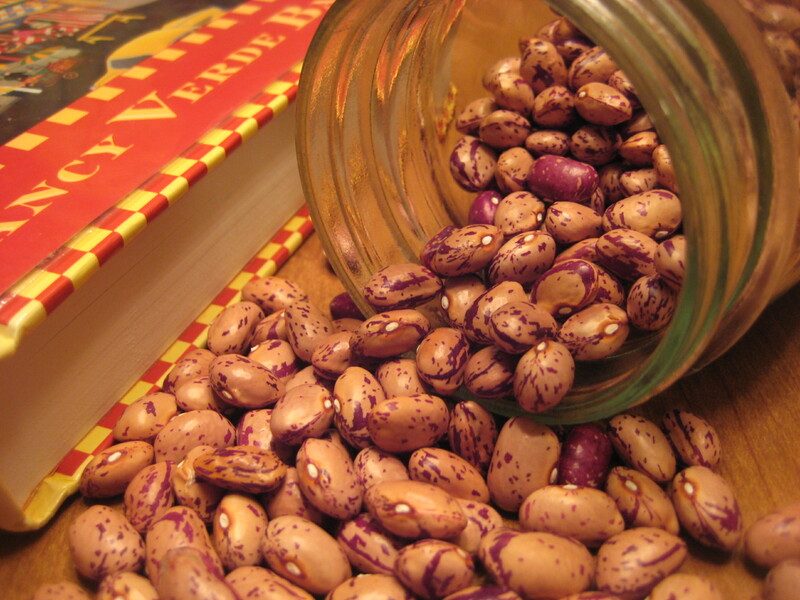 This entry was posted in Books, Cooking, Vegetables and tagged bean soup, beans, dried beans, Nancy Verde Barr, slow food, soaking beans, soup, table prayer, Tongue of Fire, We Called It Macaroni, winter. Bookmark the permalink. on our notes to one another. And so I say to you: Eat More Beans! Hope you saved me some!